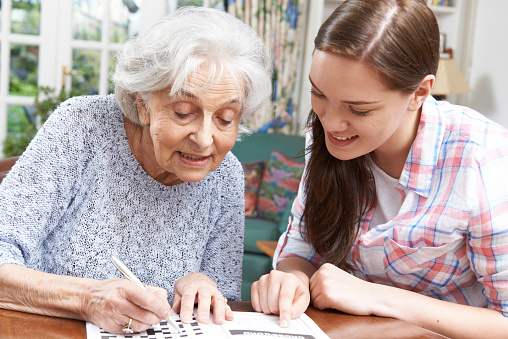 The health benefits of crossword puzzles have been well documented for adults, and the elderly. Additionally, the suggestion that completing crossword puzzles in a group can improve communication skills and cooperation. What is rarely discussed, however, is the benefit crossword puzzles can play in childhood development. Children frequently start out with jigsaw puzzles in large, simple shapes that fit into a board with cut outs. They move on to more complex puzzles in order to improve their hand eye coordination, cognitive skills, and emotional skills as they learn patience. Crossword puzzles improve language skills, have benefits to mental dexterity and concentration. They help the mind recognize patterns and improve critical thinking. So, what benefits are there to collaborative thinking? The first one is obvious- collaboration. This encourages verbalizing thoughts and contributions, as collaborative crossword puzzling requires communication. It also requires the ability to shift your perception. You may come across a clue that you are sure you know the answer to, however someone else believes the answer is something different and both fit your current puzzle. Two (or more) people are bringing different viewpoints in order to reach the same goal- completing the puzzle. As the process requires communication, each puzzler is hearing another perspective. Additionally, when working in a group you are able to piggyback on other people’s thoughts. Sometimes hearing someone talk their thoughts out loud can jog your memory into assessing the puzzle using a different tact, which can lead to the answer. When working in a group to do anything it’s frequently known as brainstorming. Brainstorming and piggybacking are similar, in that both involve working by thinking out loud. This can also improve your chances of coming to the correct answer, as a puzzler might be on the verge of coming up with an answer, and talking it out can help the group finish the thought. Crossword puzzles initiate deep thinking and creative learning, and doing so in a family group spreads the knowledge. When you consider quiz teams, each person has a different frame of reference, which means they can answer particular sets of questions more comfortably than the other members of the team. The same can be said when it comes to puzzlers. If parents regularly involve their children in the crossword puzzle process they are collaborating to share their knowledge. The majority of puzzles have a theme, and part of the crossword puzzle process is recognizing the pattern which explains the theme. They are also an excellent way to install confidence in your child, and teach them puns, metaphors, and plays on words that are frequently used in crossword puzzles. How you choose to approach your puzzling in a group is up to you, but the process might be made easier provided everyone can read the clues for themselves, as well as see the puzzles themselves.